Google Tests AdWords Searcher Polls: Is This Ad Useful? 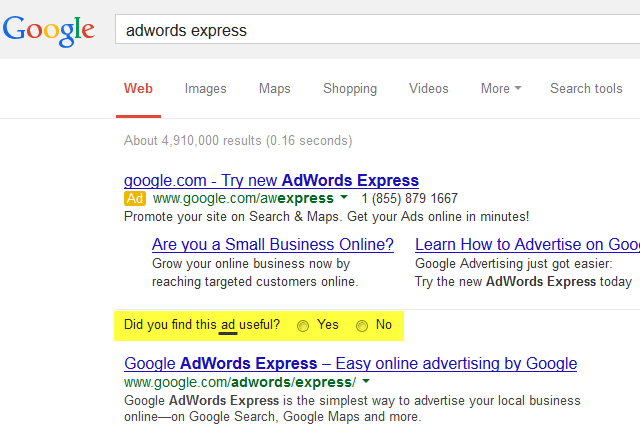 Home > Google News > Google AdWords > Google Asks Searchers: Did You Find This Ad Useful? Google Asks Searchers: Did You Find This Ad Useful? We've seen this before on the organic and paid side, where Google explicitly asks the searcher, did they find the ad or the search result useful. Instead of using actions to measure, in this case, Google asks using a poll. Kim Clinkunbroomer (always wondered if she changed her last name when she became an PPCer) posted a screen shot of seeing the latest Google ad poll on Google+. Here is a screen shot from Kin showing the new ad format followed by a poll asking, "Did you find this ad useful? Yes or No." It is not that unusual to see these but honestly, I have never seen it myself.